Whilst in Fiji recently, Tess Newton Cain met Tara Chetty of the Fiji Women’s Rights Movement (FWRM). You can listen to a podcast of their conversation here or download the full transcript here. But for the edited highlights of what they discussed, read on. In terms of methods available to capitalise on the opportunity, focus is now shifting from what goes into the constitution to working with political parties to support female candidates, up-skilling women who are seeking election and raising awareness among the voting public about inclusive leadership and representation. However, there are also some very significant challenges to be faced. In particular, the military-run state is inherently hostile to women and has demonstrated a particular antipathy towards ensuring women participate as elected representatives. In addition, prevailing social norms in Fiji are essentially conservative. Although there are women chiefs, women generally occupy subordinate positions in Fijian households. As is the case elsewhere in the Pacific, gender-based violence is a serious issue in Fiji. It is a very particular manifestation of the same social norms that undermine the status of women more generally and social acceptance of women as political representatives. Within civil society, the Fiji Women’s Crisis Centre provides the lead in this area. Their work has indicated that the machismo associated with military rule, combined with a political crisis, plus the associated socio-economic problems has likely worsened gender-based violence. Not only that, but there has been a ‘rolling back’ of positive measures such as the effectiveness of ‘no drop’ policies as a result of militarisation of the police services. Although there are certainly pockets of young people involved in pro-democracy work in Fiji, there is still a lot to be done to try and engage that group in the wider process in the lead up to the 2014 elections. This post continues our Pacific conversations series, where Tess interviews Pacific leaders and influential figures. Tess Newton Cain is a Research Associate at the Development Policy Centre. Tara Chetty is Program Director at the Fiji Women’s Rights Movement. 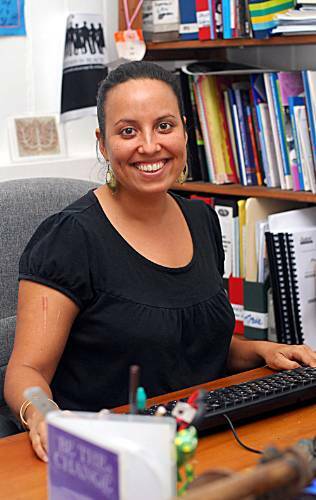 Tara Chetty is Program Director at the Fiji Women’s Rights Movement.